A short (13 page)summary (Acrobat (PDF) 212kB Nov11 07) (including several of the most significant satellite pages) of thermodynamics as it applies to geological phase equilibria, is available. The Oxford English Dictionary says: "Thermodynamics: the theory of the relations between heat and mechanical energy, and of the conversion of either into the other." In simpler terms, we can think of thermodynamics as the science that tells us which minerals or mineral assemblages will be stable under different conditions. In practical terms, thermodynamics not only allows us to predict what minerals will form at different conditions (forward modeling), but also allows us to use mineral assemblages and mineral compositions to determine the conditions at which a rock formed (thermobarometry). The calculations are often complex and are best carried out using thermodynamic modeling programs or programs specifically designed for thermobarometry. Along the reaction line, ΔGrxn = 0. Above the line ΔGrxn < 0; below the line ΔGrxn > 0. All phases, whether mineralogical or not, have an associated Gibbs Free Energy of Formation value abbreviated ΔGf. The ΔGf value describes the amount of energy that is released or consumed when a phase is created from other phases. We can calculate the Gibbs Free energy of any reaction (ΔGrxn) by summing the energies of the right-hand side (products) of the reaction and subtracting the energies of the left hand side (reactants). If the calculation reveals that ΔGrxn < 0, the reaction proceeds to the right. If the ΔGrxn >0, the reaction proceeds to the left. Consider the reaction: albite = jadeite + quartz. Under normal earth surface conditions, the Gibbs Energy of this reaction is greater than zero. 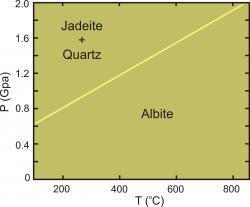 Consequently, albite is stable and the assemblage jadeite + quartz is unstable. 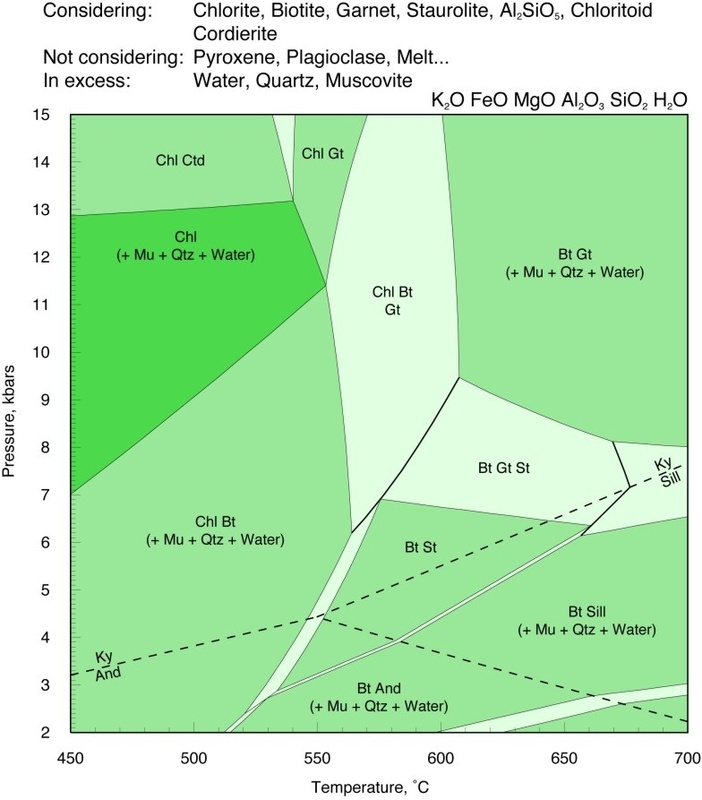 The ΔGf of a mineral varies with changes in pressure (P), temperature (T) and mineral composition (X). Consequently, the ΔGrxn for any reaction will vary with P, T and X, being positive in some portions of P-T-X space and negative in others. The result is that we can plot reactions on phase diagrams. Along any reaction line, such as the one separating the albite and jadeite + quartz fields shown in the diagram here, ΔGrxn = 0. Doing thermodynamic calculations requires reliable thermodynamic data. Additionally, although the calculations can be done by hand or with a calculator, they are complicated and time consuming. More information about Gibbs Free Energy and other thermodynamic functions . . .
More information about fundamental thermodynamic calculations . . . Thus, there is need for a database that does not include erroneous data, that reconciles calorimetric and phase equilibrium data, and that is internally consistent. Different workers have approached this problem in different ways, leading to the well-known datasets of Holland and Powell (Holland and Powell reference list) or of Berman (Berman reference list). Thermocalc performs the same calculations as TWQ for a much larger number of phases and includes more complicated types of calculations that involve the effects of bulk composition on mineral stability. Melts is the only widely available program that allows thermodynamic calculations to be made for equilibria involving magmas. Perplex is a thermodynamic calculation package suitable for rapidly creating phase diagrams of all types, creating equilibrium phase diagrams (pseudosections: phase diagrams that include only those reactions experienced by a particular bulk composition). Theriak-Domino is a suite of programs that can be used for calculating equilibrium phase diagrams (pseudosections: phase diagrams that include only those reactions experienced by a particular bulk composition) and for a number of other kinds of calculations. Phase diagrams are graphical representations of the equilibrium relationships between minerals (or others phases). These relationships are governed by the laws of thermodynamics. Standard phase diagrams show how phases or phase assemblages change as a function of temperature, pressure, phase composition, or combinations of these variables. Some phase diagrams (those for 1-component diagrams) depict relationships involving multiple phases having the same composition (for example, the relationships between the vapor, liquid and solid forms of H2O). Other diagrams (such as the one shown on the right), depict the relationships between a number of compounds having different compositions. Still others show how compositions of phases change under different conditions. More information about phase diagrams and examples . . .
Thermobarometry refers to the quantitative determination of the temperature and pressure at which a metamorphic or igneous rock reached chemical equilibrium. Many programs exist to facilitate such calculations, but most are only applicable to specific kinds of rocks and mineral assemblages. More information about thermobarometry . . .
Cemic, L. (2005) Thermodynamics in Mineral Sciences: An Introduction. Springer. 386 p.
Fraser, D. (1977) Thermodynamics in Geology. NATO Science Series: C. Kluwer Academic Publishers. 424 p.
Nordstrom, D.K. (2006) Geochemical Thermodynamics. Blackburn Press. 504 p.
Greenwood, H. J. (ed) (1977) Short Course In Application of Thermodynamics to Petrology and Ore Deposits. Mineralogical Association of Canada, 230 p.
Kern, R. and Weisbrod, A. (1967) Thermodynamics for Geologists. Freeman, Cooper and Co. 3-4 p.
Spear, F.S. (1994) Metamorphic Phase Equilibria and Pressure-Temperature-Time Paths. Monograph of the Mineralogical Society of America. 799 p.
Wood, B.J. (1977) Elementary Thermodynamics for Geologists. Oxford University Press. 318 p.
Wood, B.J., and Fraser, D. G. (1976), Elementary Thermodynamics for Geologists. Oxford University Press, 303 p.